Master important topics such as Charts and Graphs, Working With Data, Dynamic Formula, and Named Ranges. Learn Excel 2016 Intermediate takes you well beyond the beginner stage to become an Excel power user. Now you can possess the more advanced skills that will set you apart from others. The course consists of 39 individual video tutorials that last a full 4.5 hours. Work at your own pace and take as much time as you need. This lets you fit the course work with your work schedule and life. Or speed through the course to give yourself crash mastery. This Intermediate level course gives you the additional advanced skills you need to become more valuable at work. Also perform more impressive duties in your own business, for volunteer work, or to augment fun hobbies. Excel is part of the MS Office package that is used in business everywhere in the world. 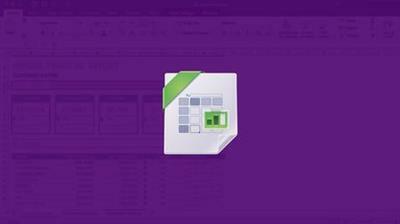 Now you have access to a step-by-step course that empowers you to become an impressive Excel power user. Instruction is professionally produced for clarity and ease of learning. Each process is explained in detail with lots of illustration. Step by step instruction makes functions easy to understand and remember. Learn Excel 2016 Intermediate starts where the beginning Excel course concluded. This course gives you more advanced mastery of working with Excel. Rather than being limited to a few functions, this Intermediate course lets you go much deeper into the remarkable power and functionality of MS Excel. The course starts by explaining terminology, tips and tricks in the ribbon, hotkeys, and defining your Excel view. This approach to the beginning gets learners off on the right foot. You gain a better understanding of finding your way around Excel. The next few chapters present interesting video tutorials that fully explain Indexing and Lookups. The various functions are illustrated and discussed and case study lookups are explored. Additional chapters talk about intermediate creation of charts and graphs and working with data. DataTables, Data Slicers, Pivot Tables and much more. Video lengths range from around 3 minutes to 11 minutes. This lets you learn in small manageable blocks that can be studied around a busy schedule.